I’ve started to develop a real soft spot for Mexican food and cookery. The flurry of openings of great Mexican Street food eateries such as Boho Mexica, Lupita and Wahaca have really put the cuisine on the map in London. For me, there’s an intriguing mystery about the food culture of this faraway land… from the vibrant colours, to the explosive heat of their salsas, to the alchemy involved in transforming 30+ ingredients (including chocolate and chilli) into an intricate mole poblano. Its food that is exciting and just so alive. Here’s a simple recipe for a fabulously fiery Tomato Salsa from Wahaca founder Thomasina Mier’s book Mexican Food: Made Simple. With salsa this fresh and this good, there’s very little you need to do with what you serve it on. We had it this time around with some cajun-spice marinated steak tortillas and Romaine lettuce but I imagine it will work just as well as a condiment alongside chicken tortillas, fish tacos or just plain tortilla chips. 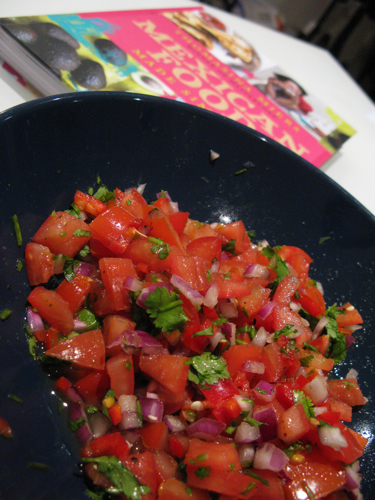 Mix the diced tomatoes, onion, coriander, chillies, olive oil, sugar, salt pepper and half of the lime juice. Add more lime juice, sugar, salt or pepper to taste. Leave to marinate for at least 20 minutes before serving to give the flavours time to amalgamate. 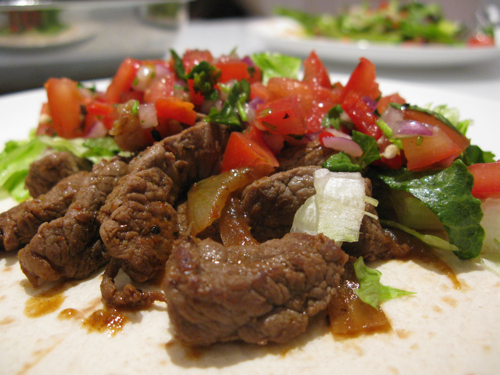 While the salsa is sitting pretty, marinate some strips of rump steak or chicken in cajun seasoning. Pan-fry on a medium to high heat (6 minutes for medium-rare steak, 10-12 minutes for chicken) and serve on top of warmed corn tortillas with chopped Romaine lettuce. Top up generously with the Tomato Salsa.